108. Two B's. Two B's, guys. #108. Two B's. Two B's, guys. This moment wasn't as laugh-out-loud hilarious as some of the others on this list, but I always thought it was funny and charming in a sweet kind of way. 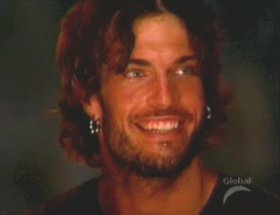 Day 18 was Robb Zbacnik's last day in Survivor: Thailand. 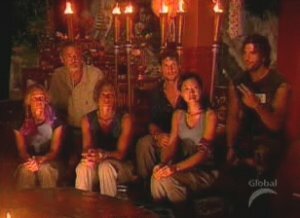 Sook Jai had lost the logic flag puzzle immunity challenge, they were going to Tribal Council that night, and most everybody knew that Robb would be the one going home. His time in the game was just about up. The problem, however, was that nobody on Sook Jai knew how Robb was going to react. Here was this kamikaze skater punk, who had a motor mouth, a hair trigger, and was a stressed out bundle of energy at all times... and I think people were a little worried about what his reaction was going to be. 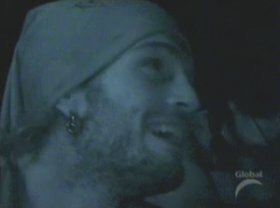 What would happen when Robb saw his name come up at Tribal Council? Was he going to snap and start screaming at everyone? Was he going to throttle somebody like he had tried to strangle Clay? 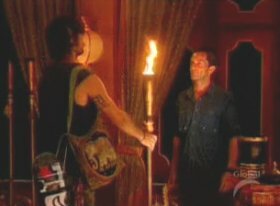 Was he going to tear up the Tribal Council set like a five year old throwing a temper tantrum? Or was he going to fling himself down to the ground in protest like he had just stepped on another stingray? All of those seemed like very legitimate possibilities. And nobody was entirely sure what was going to happen. 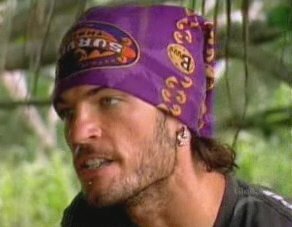 Even though Robb had given an emotional speech around the campfire that night, talking about how much he loved everybody, and how much the game had changed him, deep down I think Sook Jai was still a little wary of him. They had seen too many random outbursts to think he would actually be able to control himself. Robb just seemed like he was destined to go out with a bang. All of this was interesting, but it really didn't matter to Sook Jai, because tonight was the night Robb was supposed to go home. So one by one, they walked up to the voting podium and wrote down his name. Everybody on the tribe voted for him, and then they came back to their seats to wait. And possibly brace themselves for how he was going to react. And what happened is the #108 moment on this list. "Two B's. Two B's, guys." The votes started coming up, one after the other. "Rob." "Rob." "Rob." But the funniest thing was that Robb wasn't even all that upset. Everyone expected some sort of outburst, but it never did come. It turned out that Robb truly had changed and grown up since his epiphany around the campfire just a few hours before. In fact he seemed downright amused by the fact that he was leaving the game. The only reaction from Robb at all was when he jokingly corrected all the misspellings of his name. He simply chuckled and said "Two B's. Two B's, guys." And that was it! There was never anything even close to an angry outburst. Robb just walked up to have his torch snuffed, told Jeff "thanks, brother", and then thanked everybody for playing the game. He said "Much love, much love" and "My hat's off to you guys" and that was it! There was no anger or no drama whatsoever. Robb Zbacnik's exit from the game wasn't all that funny on a comedic level, but the fact that his reaction surprised everybody has always made me chuckle. And his "Two B's" quote is one that has stuck with me even to this day. The phrase was cute, it was charming, and it was easily one of the best moments of the entire season. And it came from Robb Zbacnik, one of the best characters we have ever had on the show.